Super5 Rocks and I'm a big fan ! 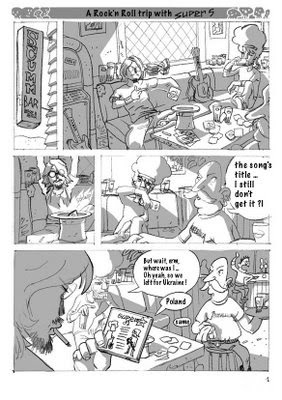 So here's the translated version of page 1 of the "Rock'n'Roll trip with Super5". This French comic is a co-production by Super5, published as a Attribution-Share Alike 2.0 France Creative Common Attribution Licence; the license of this Artwork has been changed to artlibre.org (see original post )- which is similar and compatible with the previous CC-SA license. Here's the original post Blog d'un robot: Rock Robot (in French).